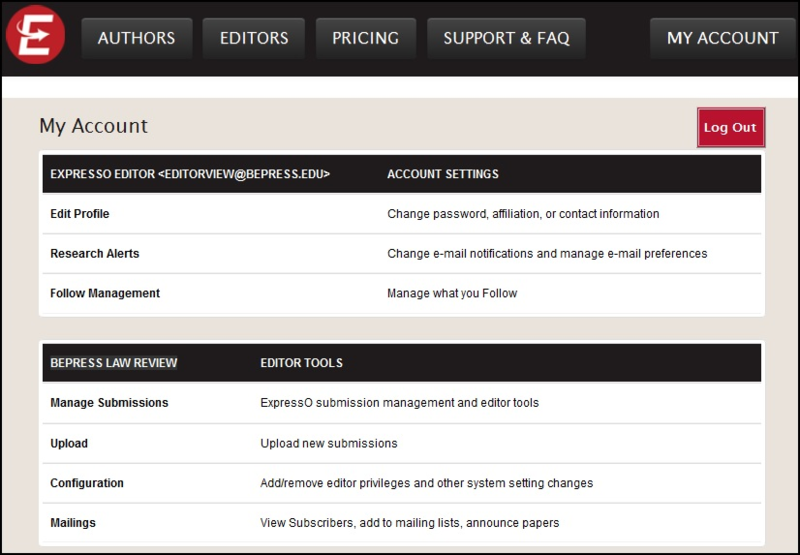 ExpressO offers a fast, effective, and comprehensive professional submissions management system for law review editors. Our editorial tools and key features, including Expedite Preference, Integrated Auto-Withdraw, and a Submission Rating Tool, allow you to easily track, assign, review, and rate articles. The following instructional guide shows you how to configure and use these tools, and more. ExpressO supports a wide variety of workflows, and we have the tools to help you optimize your account to meet your editorial needs. If you have any questions or need any assistance, feel free to contact us by email to expresso-support@bepress.com or by phone at 510.665.1200 Ext. 2, option 1, 8:30 a.m. to 5:30 p.m. Pacific time. 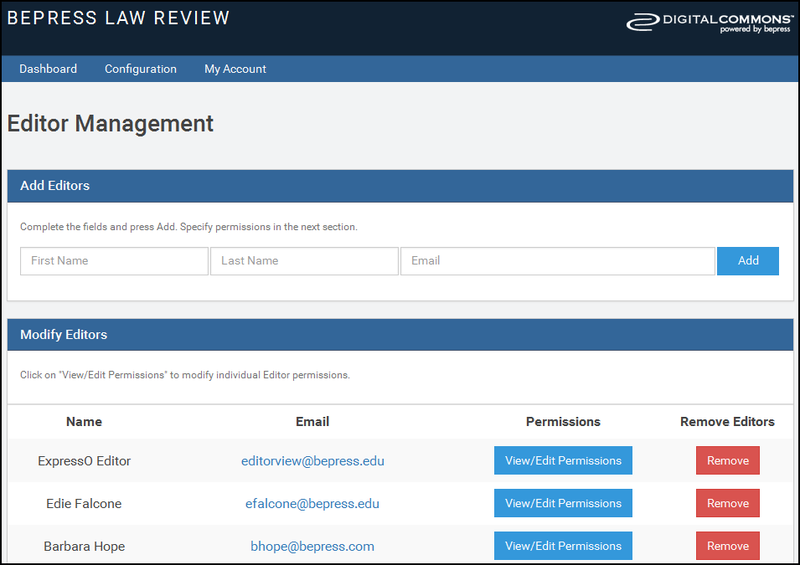 To access your law review’s free online account, your ExpressO account must be setup with editorial privileges. As your account is setup under your review’s submission email, you can start with that address. Once you access, you can then add your fellow editors to the account via the Configuration page. Enter your ExpressO account information when prompted to log in with your email address and password, and click Login. If you’re using a different address and you find you do not have editorial privileges set up for your ExpressO account when you go to the My Account page, please contact Consulting Services at expresso-support@bepress.com to request that your account be configured with editor privileges. Be sure to include in your message your name and the name of your law review. Once your editor privileges are set up, you can access your editor tools from the My Account page. The Configuration link on your My Account page is the access point for your law review’s settings. Be sure to complete all four of the following steps. It is not necessary to create an ExpressO account for each editor prior to adding them to your editor list. The system will automatically create a “shell” ExpressO account for each once you add them to the Editor Management page. To complete the account setup process, editors must visit ExpressO, click My Account, and login with the password field blank. The system will then prompt them to create a password. Only when newly added editors create a password will an account confirmation notification be generated. Your review’s submission address is, by default, marked to receive all new submission notifications and is auto-assigned all incoming articles: Receive email notifications and Is assigned submissions by default. If other editors also want to receive these notifications, check mark the box next to Receive email notifications in their View/Edit Permissions. Note: Only one account should be marked Is assigned submissions by default (auto-assigned incoming articles), as submissions can only be assigned to one editor at a time. Once a submission is received, you can then use the Assign Editor or bulk Assign option to reassign to others as needed. To remove an editor from your review’s account completely, click the red Remove box and confirm the action on the corresponding prompt by clicking Yes – Remove. Note: Each bucket you add requires its own email address. It can be an email you establish just for the purpose of creating a bucket (e.g., Gmail). Why use buckets? Article buckets are similar to editor accounts, but they serve a different purpose. They are essentially holding pens for articles at various stages of review. Adopting article buckets will enable you to manage your submissions more effectively. Using article buckets means easy access to all articles recommended for further consideration or recommended for rejection. If your workflow uses more than two buckets, feel free to add as many as required. See the Preliminary Review section below for additional information about article buckets. ExpressO offers editors a Priority Expedited queue for expedited articles. While authors can expedite without restriction, these requests can be prioritized based upon criteria you set. How many simultaneous requests do you think an author should send out if they are serious about asking your review to take a rushed look at their piece? 20? 50? 100? We let you decide and then we share your preference with authors. The goal is to encourage authors to be much more selective about how many law reviews they ask to give priority to their article at any one time. Whether or not authors exceed your preference number, you will still receive all expedite requests made to your review, which you can view through your online account. However, you will not receive email notifications of expedite requests that do not meet your criteria and they will not make it onto your Priority Expedited queue. Do you ever find authors make expedite requests based upon offers from law reviews that are not even in the same ball park as yours? Wish to be alerted to “serious” offers only? Simply select your peer reviews from our list participating law reviews, and only articles that have offers from your peers will appear in your Priority Expedited queue. How you determine your “peers” is up to you; they may be similarly ranked or share the same subject area, and you can change your selection at any time. For example, you may want to know if an offer came from a more highly ranked review as this may help you decide whether or not to make an offer. Note: Your peer list is private to your review. Unlike your preferred number of submissions, information about your peers is not shared with authors. Note: You may search by name, or refine your search by the Top 100 or by subject category. After you make your selection, click the Continue button. Your selections are saved automatically. ExpressO automatically confirms the validity of any offer made by another law review using ExpressO, and reflects this as a green check mark on your Manage Submissions page (under the Expedite Due column). If you wish, you can also encourage authors to confirm offers made outside of our system, by enabling the ExpressO Certification Preferred setting. This kind of transparency saves editors time since they will no longer have to follow up with authors on incomplete expedite requests or with other law reviews to confirm the offer. Customize your responses to authors with convenient templates for submission decisions and other messages to authors. Note: The templates use system macros (e.g., “<macro publication.title>”) that are auto-completed when your correspondence is sent. Also, a few of the macros will vary slightly between the decision templates (Register Decision) vs. the author message templates (Email Authors). For example, for your review’s title, it is <micro publication.title> for the decision templates, but <macro publication.title encode=”html”> for author messaging. Same for author submission title: <macro my.title> vs. <macro my.title encode=”html”>. Need to close your review from receiving author submissions? Place your review on temporary hold for as long as you need. Note: There is a maximum 100 character limit for the hold message. An example of the standard message is provided on the Configuration page. It helps authors if you include the date your law review will re-open. 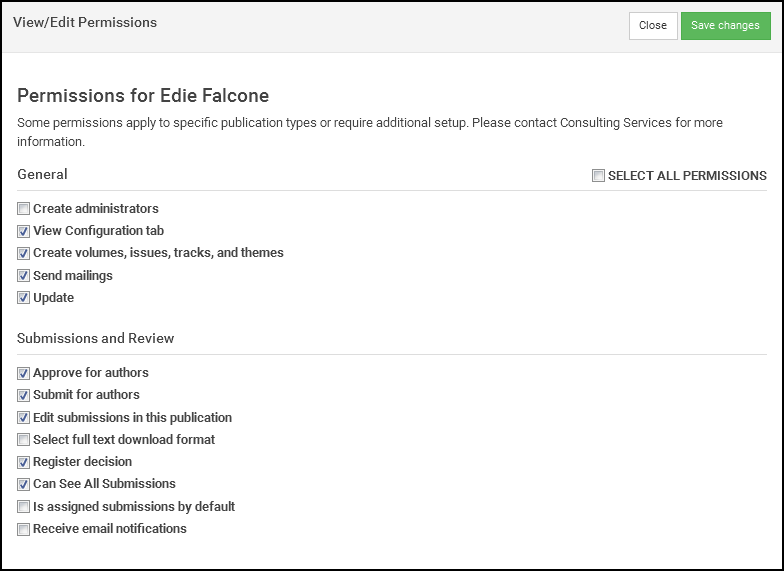 Customize submission notifications to your review with the option to include or exclude submission documents (i.e., author article, CV, and/or cover letter). Whichever option you choose, each notification already includes a direct link for quick access to the submission so you can view and manage through your review’s online account. Does your review use an evaluation form for editors to complete as part of the review process? Add your review criteria to the Evaluation Template so editors can provide the feedback and comments you need to help make a decision. Editors can add their comments via the Editor Comments and Evaluation feature available for each article. Sample evaluation questions are already provided for your convenience. See section Preliminary Review for more information. Note: You may also access this template directly through the Editor Comments and Evaluations form by clicking on the Edit Evaluation Form button. While ExpressO is designed with the knowledge that each law review often has its own unique workflow and allows you to customize it to fit your review’s needs, the following outline of ExpressO features is represented as general workflow of the editorial process from beginning to end. There are two ways manuscripts get uploaded to your publication: the author submits his/her manuscript through the ExpressO website; or, the author emails the manuscript to the editor who then uploads it on behalf of the author. Both scenarios for submitting manuscripts are outlined below. Regardless of the method used, submitted manuscripts are stored in the Not Yet Published (or, pending) queue in the Manage Submissions screen within ExpressO. Select Law Reviews: From the following page, https://www.bepress.com/products/expresso/authors/, the author clicks the Start Your Submission! link to search and select law reviews by title, subject category, the ExpressO Top 100, or to simply browse through our alphabetized list. Article Information: Authors add their submission metadata (i.e., article title, abstract, subject categories, etc. ), and uploads the submission documents. Review & Payment: Authors review their submission information, including metadata and selected law reviews. Complete the submission process by agreeing to the terms of service and clicking Finish. As soon as the process is completed, the submission is automatically uploaded to the online account of each review selected by the author, and at least one designated editor is automatically notified via email of the new submission. The email notification contains basic information about the submission, including author name, article title, subject categories, as well as a direct link to the submission through the review’s online account. Editors may opt to also include the submission documents attached to the notification as well. See the Submission Attachments (Optional) for more information. Thus, the editorial process begins. As an editor, you can view all pending Not Yet Published manuscripts for your publication via the Manage Submissions link on your My Account page (see section Receiving and Assigning Manuscripts in this document). Authors may view their submission and delivery information via their My Account page. Enter the author’s information, including name and e-mail address. You can also add co-authors by clicking the Add Author button as needed. When the author information has been added, click Continue. Review the author information and then enter the submission metadata. Follow the prompts to upload the file of the manuscript. Click Submit. Editors can also attach associated files to the submission using the Supplemental Content link in the left sidebar of the Submission Details page. This may be helpful if the author sends your law review additional files outside of the ExpressO system that should be included with their submission, such as a data set or an appendix. Whether manuscripts are submitted directly by authors or by the editors on behalf of authors, all submissions appear in the Not Yet Published list on the Manage Submissions page until they are accepted, withdrawn, or rejected. This section discusses the process of moving a manuscript from the initial submission through to an editorial decision. By default, the resulting screen (as seen below) shows a list of manuscripts assigned to you as an editor. You may view all submissions, or specifically those assigned to other editors by utilizing the search filters in the upper portion of the page. The Manage Submissions page serves as the central hub of all submissions received by your review, and will be very helpful to you as manuscripts move through the editorial process. At a glance, you will see the manuscript ID, author name, submission title, editorial status, expedite due dates, editor assigned, and any reminder email dates associated with each article. You will also see recent author correspondence as well as view editor comments including current submission ratings (average). Additional submission details, including author institution and subject categories, are also available on the Article Details window that automatically appears when you hover your cursor over the article title. This feature will be especially helpful if you assign articles to editors based on subject category. To view an individual submission, click on either the manuscript number, title, or the blue View Article button that appears on the Article Details window. The resulting screen displays the submission details in neat sections: Editor Notes (if any), Files, Submissions Details, and Expedite Decision Requests. 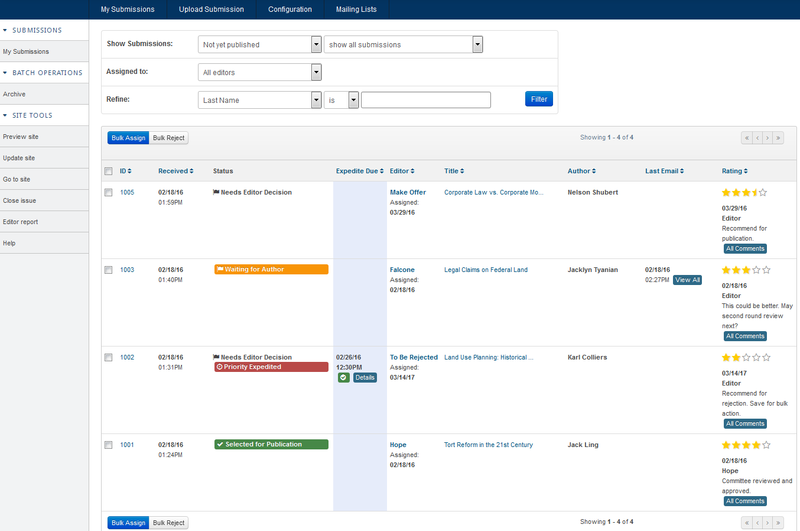 All of the commands needed to manage the submission will be available conveniently on the right side of the page in three main sections: Actions, Contact, and Activity. The corresponding page will display a list of available editor names. Click the button next to the name of the editor you want to be responsible for this manuscript. Note: Authors cannot see this text, but all editors can. Click Assign. An email message will be sent to the newly assigned editor, informing him/her of the assignment. Any comments will also be included in this email. The manuscript will now list the last name of the editor in the Editor column in the Manage Submissions screen. After a submission is assigned, all correspondence from the submission’s author(s) will be directed to the assigned editor. Tip: Interested in seeing the workload of each editor before or after assigning submissions? On the Assign Editor screen, click View the workload report. It will run a report that allows you to track the number of submissions assigned to each editor. We also now track the date that a paper has been assigned to an editor. It is visible next to the editor’s name on the Manage Submissions screen. Click Assign Articles. An email message will be sent to the newly assigned editor, informing him/her of the assignment. Any comments will also be included in this email. ExpressO now features integrated auto-withdraw. 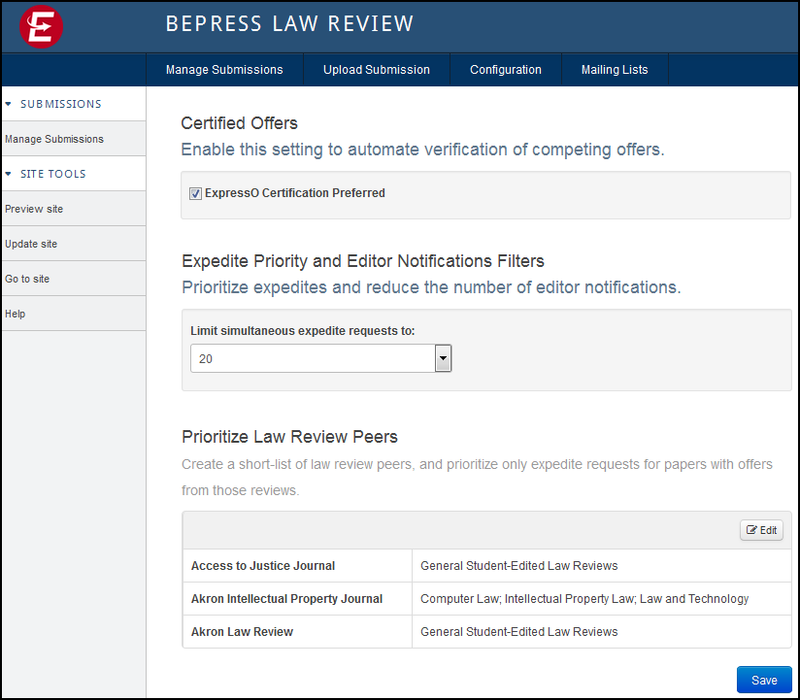 When an author accepts an offer to be published through ExpressO, editors of other law reviews will be notified immediately, and the submission will be automatically withdrawn from each law review’s submission queue. Likewise, if an author accepts an offer from your review, the article is automatically withdrawn from the queues of other law reviews. Outside of being published, when an author simply withdraws a paper, it will also trigger the automatic withdraw from the pending submissions queue as well as notify the assigned editor. Remember, authors can only confirm your offer through ExpressO if you made the offer through your ExpressO account (via the Register Decision link on the Submission Details screen). Therefore, we encourage you to use always use ExpressO to make your offers. ExpressO provides both editors and authors the tools for direct communication. The Email Authors feature allows editors to select from a list of templates to send to authors (already customized by you as part of your law review set-up). Template options include a blank form, Confirmation (of delivery receipt), Request for Electronic Copy, Student Rejection Form Letter, Expedite Confirmation, and Reject Expedite Request. Note: The Email Authors feature should not be used to send decision letters (use Register Decision, see section Editorial Decisions in this document). Select appropriate template from Templates drop-down menu. Feel free to edit the subject and body text if needed. You can also send a copy of this email to yourself by selecting the box send a copy to myself. When an author requests that their article be expedited due to a pending offer from another law review, you will receive an email from the author with the request—as long as it meets your expedite preferences. If it does not meet your preferences, you will not receive an email notification about the expedite request. This applies to email notifications of expedite requests only. You will still be able to view all requests, whether or not it meets your expedite criteria, on your default Manage Submissions page under the Expedite Due column. You may also view the expedite request on the Submission Details page, under the Expedite Decision Requests section. The dates of request and expiration are displayed, as well as the title of the law review with the pending offer, if provided. If the offer is “certified by ExpressO,” it means that we confirm that a law review has made that offer on that article, and a check mark will appear next to the Details link (in the Expedite Due column). This certification creates transparency and will save editors time since they will no longer have to follow up with authors on incomplete expedite requests or with other law reviews to confirm the offer. Important: Remember, once you set your Expedite Preferences in Configuration, you can view your preferred submissions by accessing your Priority Expedited queue. As you begin reviewing submissions, add your comments and/or use the evaluation form provided in the Editor Comments and Evaluations section. All editor comments are collected, and the most recent comment will be visible on the Submission Details screen and conveniently on the Manage Submissions for quick reference. From the Submission Details page, click Editor Comments and Evaluations under the Activity section. All editorial comments are listed here. On the Editor Comments and Evaluations screen, expand the Add a Comment or Evaluation to this Article by clicking on the down arrow. Either enter your comments in the free-form field or click on the blue Insert Evaluation Form button to use the sample evaluation form questions provided. 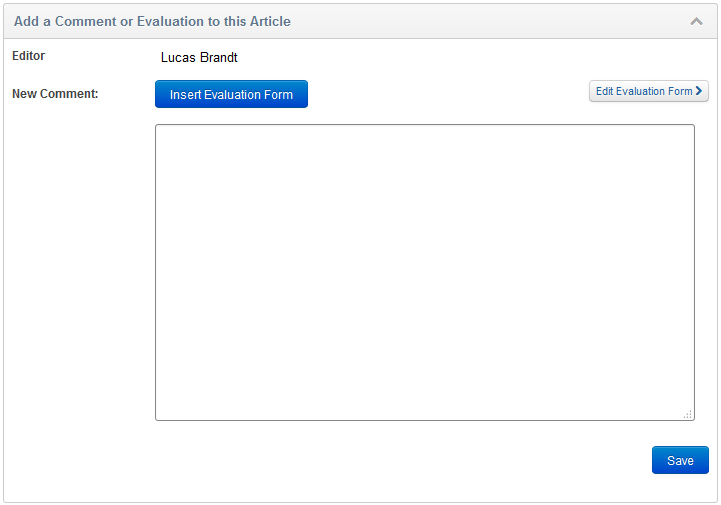 Note: Feel free to customize the evaluation form by clicking on the Edit Evaluation Form button. After adding your comments in the form, click Save. After adding your comments, quickly summarize your submission review and let your fellow editors know what you think by rating each article on a scale of 1 to 5 (1 = “Very Weak” and 5 = “Excellent”). As an article moves onto the next stage of the review process, other editors can also add their ratings, and an average is tallied automatically and displayed on the Manage Submissions page where it can be easily sorted. On the Editor Comments and Evaluations screen, hover your cursor over the stars in the Rate this article box to choose your rating. Select a rating by clicking on the appropriate star. Once you rate the submission, your rating will be reflected in the Average Rating box (along with all others), and the average rating will display on both the Manage Submissions and Submission Details pages. You can adjust your rating any time, or if you need to remove, simply click on the red circle next to the last star. Once you review, provide your feedback, and rate your assigned articles, you can conveniently move them onto the next stage of the editorial process by assigning them to the appropriate article buckets Recommended for 2nd Read and Recommended for Rejection, created during the initial review set-up phase. Remember, these buckets serve as a cue to the editorial board that an article is ready for the next step of the process, but not yet ready for a final decision. When it is time to register an editorial decision, you may notify the author via ExpressO. If the author does not accept the offer and it expires, the status will change from orange Waiting for Author to gray. For the author, the Accept button will no longer appear on their account, and the author will receive an email notification that the offer has expired and will be encouraged to withdraw the submission. If an author accepts, the status changes to Selected for Publication and is reflected in green on your Manage Submissions queue. Important: We understand you often contact authors directly with an invitation to publish, but we also encourage you to confirm that verbal offer with a written offer by using the Register Decision feature. This will ensure that your submissions queue reflects the most accurate status. Using ExpressO to make your offers, in addition to direct contact, also benefits authors as it allows them to track the status of their submission activity via their ExpressO account as well. Be sure to ask authors to do their part and accept the offer through their account. Remember, when an author accepts your offer using ExpressO, the status change will appear automatically in your Manage Submissions queue, and the article will automatically be removed from the queues of other reviews. This integrated offer process keeps everyone up-to-date and will help you from wasting time reviewing papers that have already been accepted elsewhere. Once an article is selected, finalized, and is ready for actual publication, or has already been published, then you can change to the status of Published. Moving submissions to this status removes them from the Not yet published queue, and helps you maintain and organize your article selections. This feature is intended to be used when the article requires no further revisions or edits. Before moving submissions to the Published status, you must create a volume and issue. You can create as many volumes/issues as you wish. Be sure to click the Update button to queue the site for update. Note: You can close any issue you have created at any time by click on the Close Issue link located on the left side bar under Site Tools on the Manage Submissions screen. You cannot reopen an issue once you close it. You have the option to cc the review’s editors and modify the subject and body text if needed. Rejected manuscripts are immediately removed from the Not Yet Published list on the Manage Submissions page. (Rejected manuscripts can be found by filtering the Manage Submissions page to display manuscripts in the Rejected state). Note: Once you reject an author’s submission, the author will no longer be able to send through ExpressO any correspondence regarding this manuscript. Once you decide which articles are to be rejected, you can conveniently use Bulk Reject to reject multiple articles at once with the option to notify the author(s) and editors. This is a powerful tool that registers a final editorial decision on the articles selected. On the resulting screen, your selected articles are displayed. Confirm your selection by clicking the checkbox beside the appropriate articles. Note: Once an article has been rejected, editors cannot take further action on that article. If you reject an article by mistake, please contact Consulting Services at expresso-support@bepress.com and we can revert the article to pending status. When you have made your publication selections and you want to clean out your Manage Submissions queue, you can quickly remove all articles in the Not yet published queue by using the Archive feature. Important: Because the archive tool will move all articles that are in the Not yet published queue to the Rejected queue, and the action is not reversible, we recommend that you first mark the submissions you have selected for publication as Published (see above). Our advanced features include the ability to revise submission metadata and upload and manage updated versions; summarize submission data for metrics tracking; and upload and send messages to your law review’s subscribers. If any part of the submission metadata needs to modified, or if you need to upload a new version, simply navigate to the Submission Details screen and select Revise Submission under the Actions section. You need only modify the necessary elements—other items in the form should be left untouched. It is very helpful to include a brief but descriptive statement in the Reason for update field at the bottom of the form so there is a clear record of how the different submission versions vary (e.g., “Adding co-author”). You can also view a list of all revisions to the article and select a “current version” of the submission slated for publication. The “current version” is the one chosen for publication. The editor finalizes this decision on the submission’s View Revisions page. Tip: You may also view all of the activity of any article by clicking on the History link under the Activity section on the Submission Details screen. Major actions taken by author, editor or bepress support will be logged on this page. Interested in learning more about submissions that have been reviewed by your editorial board? Want to know the turnaround time for articles? You can answer these questions by clicking on Editor Report in the left sidebar from your Manage Submissions page. Note: Depending on your editor privileges, you may or may not have access to this tool. Our Mailing List feature allows you to create custom messages to subscribers to your law review. You may maintain your contact list and generate messages at any time. You can also view messages sent. Access to this feature is available as a link on your My Account page as well as on the Manage Submissions page. Note: Depending on your editorial privileges, you may not have this access. Click on the Subscribers link located on the left side bar. You may add one email address at a time or upload a text file for multiple addresses. Note: Your message will be queued to be sent. It may take some time to send. Be sure to check the status of your message by clicking on the Messages link located in the left sidebar. If you have any questions or need any assistance, feel free to contact us by email to expresso-support@bepress.com or by phone at 510.665.1200 Ext. 2, option 1, 8:30 a.m. to 5:30 p.m. Pacific time.